• Leading technology between similar products. Uses the latest 4G LTE CAT M1 communication technology and enhances real-time human/vehicle interactions, and supports diverse vehicle diagnosis systems etc. It is applicable to various vehicle models and has international market competitiveness. • Unique and original product; implemented exclusively developed intellegent event engine that makes it easier for motorcades to customize management mechanisms, effectively improving functions including satellite positioning monitoring, automatic monitoring and early warning etc. • The core technology of the satellite positioning monitor holds several patents. • 4G LTE CAT M1 communication technology, easy installation. • Supporting J1939, J1708, and OBDII protocols suitable for all types of vehicles. 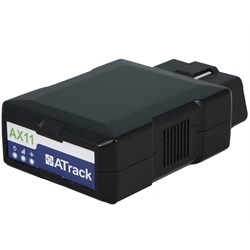 • Optional Bluetooth allows AX11 to send vehicle data to an in-vehicle display or mobile APP. • Built-in 6-axis g-sensor enables the monitoring of driving behavior. • Expandability for better fleet management.